Do you have unrealistic deadlines at work? Are you there past 5pm every day, along with most other people? Do you feel like it’s never going to get done? Is your work a series of crises, one after another? “It’s October and we haven’t started our appeal letter yet!”? Recently I was reading a book by Diane Fassel called “Working Ourselves to Death” And saw myself in there. I’m not going to assume you’re like me. But if you routinely work over 40 hours a week, this book might resonate with you too. The author, Diane Fassel, writes, “I recently encountered a book that advocated crisis as a management principle. The author reflected on the fact that, in crisis, people put aside their usual animosities. They pull together, they are selfless, and they expend extra effort. They also get a high from getting through the experience. His book counsels managers to develop the conditions under which people are responding with extraordinary dedication. They call it peak performance. 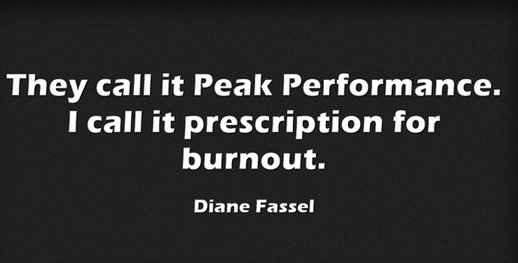 I call it prescription for burnout. Any stress expert can tell us that when the adrenals are constantly producing adrenaline, they eventually give out. When the adrenals give out, you give out. Meeting crisis after crisis exhausts the adrenals. Now, people might say, “Well if you’re stressed that’s YOUR fault and YOU have to deal with it” but they fail to take into account the management and workaholic corporate culture. A large amount of stress comes from management policy, style and climate -all of which are heavily laden with crisis. Is your whole organization actually workaholic? Is fundraising revenue more important than your health? That’s money addiction. Boasting about productivity, while remaining silent about the effects on people. Altering financial data so it does not look as bad as it is. Dishonesty about the results of their programs and their place in relation to their competitors. Like the individual work addict, who struggles with self-esteem, the organization can have trouble seeing itself honestly. These organizations exaggerate their successes and brood over failures. Workaholic organizations are judgmental about themselves. They overreact to changes, seeing each one as a crisis, not an opportunity. They frequently look for others to blame rather than take responsibility within. 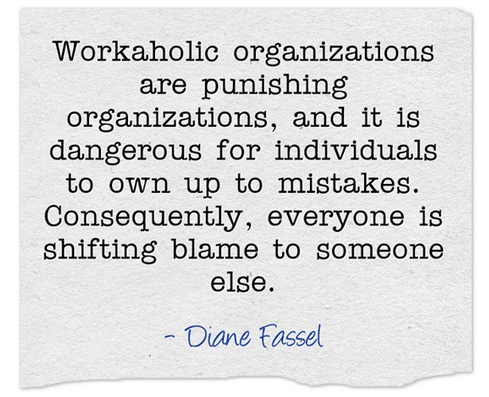 Workaholic organizations are punishing organizations, and it is dangerous for individuals to own up to mistakes. Consequently, everyone is shifting blame to someone else. Workaholic organizations never relax. They resist stepping back to evaluate or reconsider a direction. They feel driven. The workaholic pace controls workers, the unrealistic deadlines control quality, and fatigue eventually controls the final output. “Overall Workaholic organizations need workaholics to survival and conversely, employees must become workaholic to survive in these companies. For the new breed of nonprofit workers, the nonprofit is the new church and workaholism is the religion. You might be in a workaholic organization.